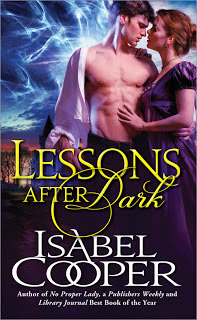 Enter to win one of two print copies of Lessons After Dark! But it’s true. Gareth has his name for a reason. It’s a little hard to see at first. He doesn’t really act the part on the surface: he’s a doctor at a school for strangely-gifted young people, not a wandering knight. He’s in his mid-thirties and walks with a limp—a reminder of his time as an army surgeon in Egypt—so it’s not like he’s going to be charging anywhere on a horse, white or not, any time soon. And he’s considerably grumpier and more jaded than his namesake, at least when Lessons After Dark begins. He does have a power that my fellow nerds will associate with knightly types, though: the ability to heal with a touch. In Gareth’s case, this involves using his own life force to mend wounds and give the injured a little extra strength. He’s been able to do that since he was young, so by the time he enters the story, he’s used to a fair amount of self-sacrifice. That’s one of the reasons he comes to Englefield, in fact. After leaving the Army, he wants—or thinks he wants—a quiet life without conflict, but his friend Simon asks him for help training people to save the world, and Gareth is not the sort of man who’d say no. Once he gets to know his students, he’s even more dedicated to the job. See, Gareth takes care of people. He makes himself responsible for them, and then he worries about them—even if he doesn’t intend to do either. He knows that most of Englefield’s students will likely go out to face dark forces, and he knows that his actions, now, might make the difference between their success or failure, their survival or their death. For a man who’s just come home from war, it’s not what you might call a light burden. It’s an honest one, though, and that matters to Gareth. Fundamentally, he’s a man of honor, with all of the positive and negative qualities that implies. He values truth and integrity highly; while the war in Egypt has outwardly dented his belief in such things (particularly where his government is concerned), inwardly he holds to them all the more strongly for that. The world has disappointed him. On the surface, he doesn’t let himself hope—but nothing feeds a feeling like repression. That principle is going to be a problem for him in another way, of course. See, Gareth’s been at Englefield maybe a day or two when he runs into Olivia Brightmore, one of the new teachers. She’s competent, she’s lovely, she’s pleasant—but Gareth has met her before, and he doesn’t think there’s anything honest about her. This is going to be a problem. Critically acclaimed author Isabel Cooper lives in Boston with her boyfriend and a houseplant she’s kept alive for over a year now. She maintains her guise as a mild-mannered project manager working in legal publishing; all the while, she’s writing dark, edgy and magical romance novels. Her debut novel, No Proper Lady, was named a 2011 Publishers Weekly Best Book of the Year in the romance category, a 2011 Library Journal Best Romance of the Year and received an RT Book Reviews Seal of Excellence for the month of September 2011. For more information, please visit http://www.isabelcooper.org.